On a map of the Juneau Icefield, Taku Glacier is a distinguished ribbon that winds out of the southeast corner of the icefield as an outlet glacier. It’s remarkably large, even by Alaskan standards. It encompasses 671 square kilometers (Pelto et al, 2013) and measures about 5 kilometers across where it passes in front of Camp 10. It’s fed by four tributary glaciers that line its upper margins, and its outline is similar to the shape of Thailand. Taku Glacier is quite special, not only because it sets a stunning scene for JIRPers to admire from the porch of the Camp 10 cook shack, but also because it’s one of only a hand-full of glaciers in Alaska (and around the world, for that matter), that has been advancing (Pelto et al, 2013). Until recently, Taku Glacier has been growing in mass. Indeed, the Taku looks unlike its neighbors as it descends toward the floodplain of the Taku River. The ice juts out over the small trees that live in its path, as the adjacent Norris Glacier looks as if it’s withering away, cracked and shrunken. Since most Alaskan glaciers are surrounded by forests that are actively creeping out onto the new ground exposed by glacial retreat, the sight of the Taku mowing over trees and shrubs as it slides down its broad valley is quite victorious to the glacier enthusiast. Positions of the end of Taku Glacier from 1948 to 2014. Adapted from a figure by Chris McNeil. Boundaries of Taku Glacier on the Juneau Icefield. Adapted from a figure by Chris McNeil. There are two main causes behind the anomalous case of the Taku. First, the glacier has a unique hypsometry, which refers to the distribution of the glacier’s surface area with respect to elevation. Most of the Taku lies above 1200 meters above sea level, so it has a huge accumulation zone (the area where annual snowfall doesn’t completely melt by the end of the melt season) compared to the total surface area of the glacier. As a result, the majority of Taku Glacier can gain mass from falling snow each year. Second, Taku Glacier is a tidewater glacier. This may strike an observer as peculiar since the Taku currently flows into a river rather than the ocean, but this classification stands based on the Taku’s behavior and bed topography. 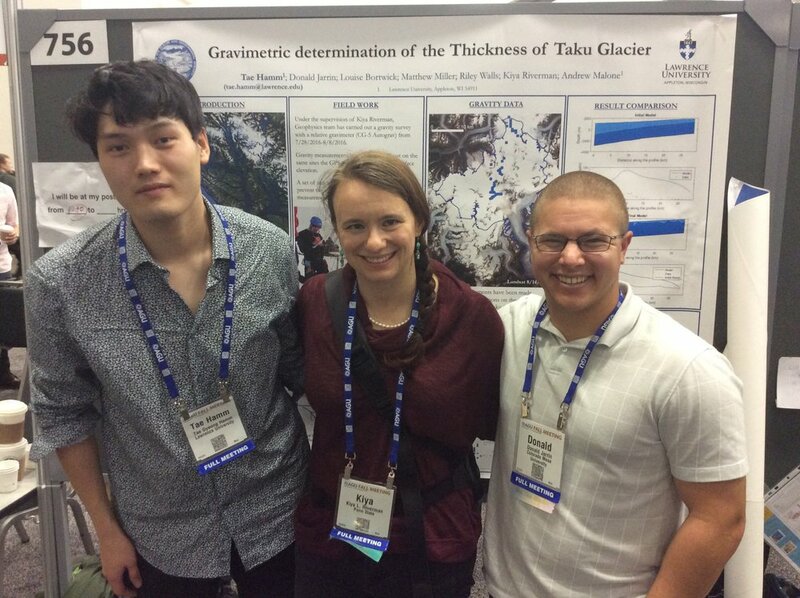 To understand the dynamics of Taku Glacier, we have to know the story of the tidewater glacier cycle. Here is a summary derived from a lecture delivered to JIRP students by Martin Truffer earlier this summer at Camp 17. As the end of a tidewater glacier, known as the terminus, rests in a fjord, the elevation of the glacier’s bed is below sea level. As a result, the melt water beneath the terminus of the glacier becomes pressurized so that it can still flow into the ocean despite the weight of the seawater column. The terminus is quickly eroded as big chunks of ice peel away during calving events and as warm sea water circulates against the terminus. Consequently, the glacier is driven into a rapid retreat, and it recoils up its valley until it reaches a resting point above sea level. There, the glacier is able to stabilize and to eventually begin an advance by pushing its dirty, icy terminus forward on a terminal moraine (a pile of sediment collected by the glacier at its terminus as it grinds forward). By advancing a homemade mound of sediment ahead of itself, the glacier can rest above the deep water of the fjord and the subglacial hydraulics are less pressurized, so the glacier is protected from the intense melting and erosion that previously drove it back. As it continues to bulge onward, the glacier eventually reaches a state where its surface balance nears zero, which means that its accumulation and ablation (melting) are equal. At this point, the glacier can reenter a rapid retreat as the tidewater glacier cycle continues. A steamship floats in front of the Taku terminus during an earlier advancement of the glacier. As for the Taku, its bed doesn’t rise above sea level until an estimated 20 kilometers up-valley of its terminus (oral comm. Beem 2016). 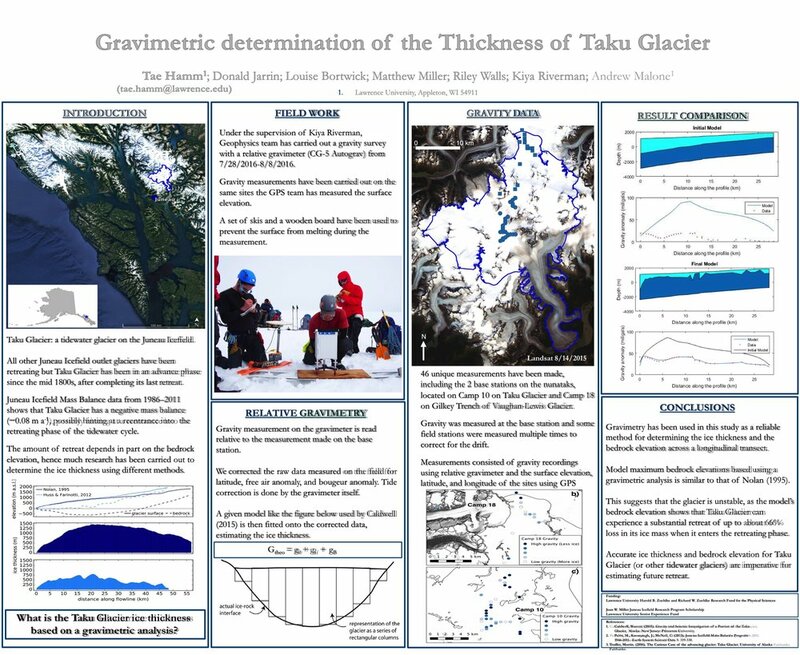 Additionally, the Taku has been in the advancement stage of the tidewater glacier cycle since 1850, but its advance has halted in the last two years (oral comm. Truffer, 2016). It’s too early to determine if the Taku has reached the end of its advance or to say that a rapid retreat is imminent. 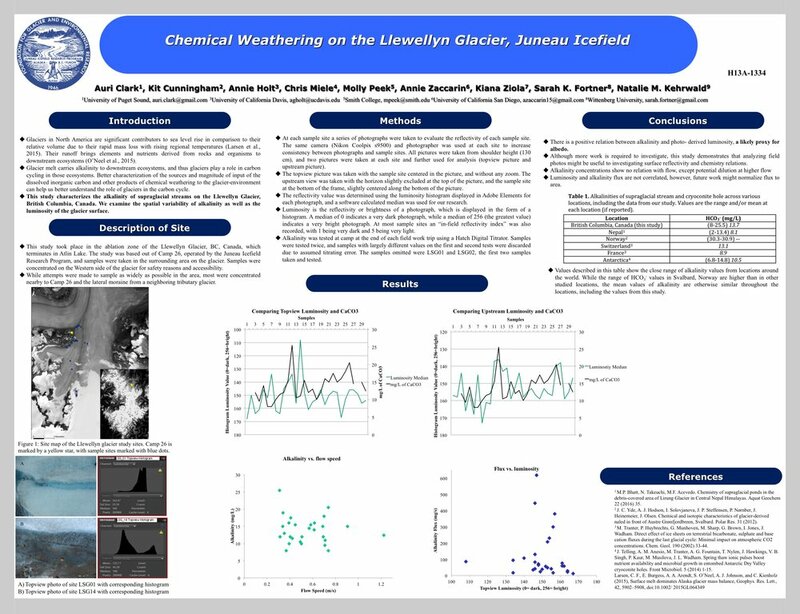 However, the reactions of the Taku and other glaciers to climate will have wide-spread impacts and can tell us quite a bit about the changing climate. Mountain glaciers account for less than 1% of global glacial ice volume, but their rapid rate of mass loss is responsible for one-third of the current observed sea level rise (Larsen et al., 2015). 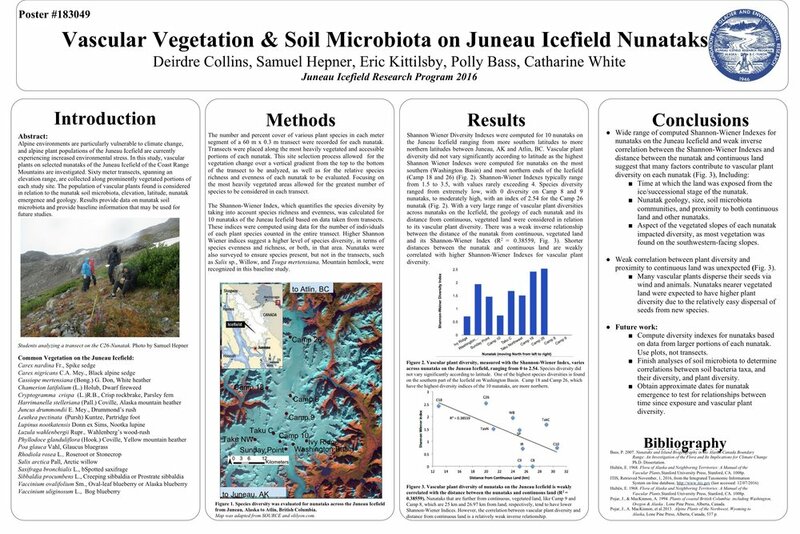 Additionally, glaciers play a big role in downstream ecosystems as they deliver nutrients and sediment as well as well as manipulate water flow, turbidity, and temperature (O’Neel et al., 2015). Consequently, these glaciers can almost directly impact where and how people near and far are living. The Taku and other glaciers captivate us as scientists and inspire us as humans to understand the complex systems in which we live. Beem, Lucas. Oral communication 2016. Larsen, C. F., E. Burgess, A. 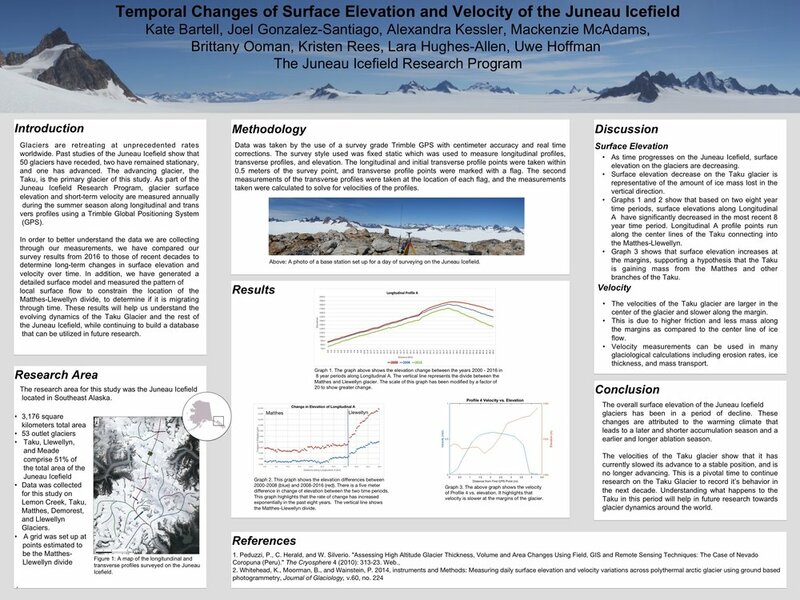 A. Arendt, S. O’Neel, A. J. Johnson, and C. Kienholz (2015), Surface melt dominates Alaska glacier mass balance, Geophys. Res. Lett., 42, 5902–5908, doi:10.1002/2015GL064349. O’Neel, S. et al. 2015. 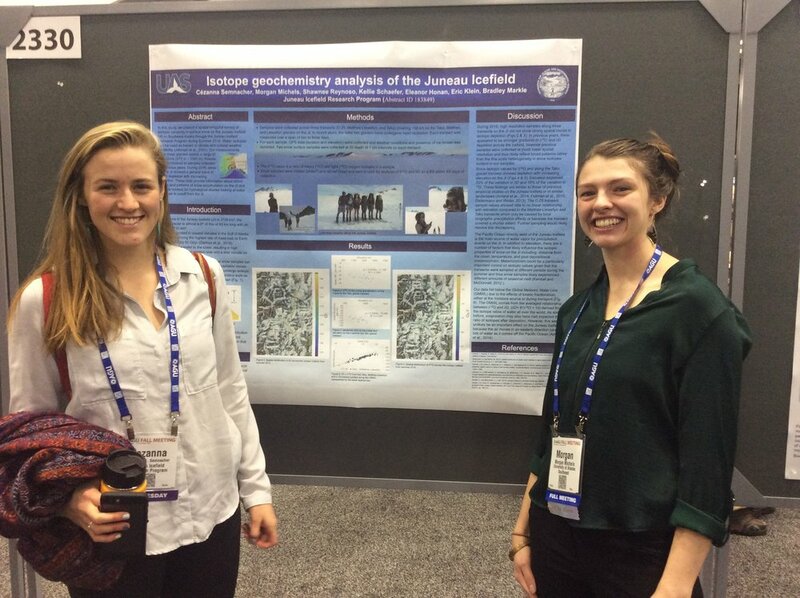 Icefield-to-Ocean Linkages across the Northern Pacific Coastal Temperate Rainforest Ecosystem, BioScience, 65, 5, 499-512. 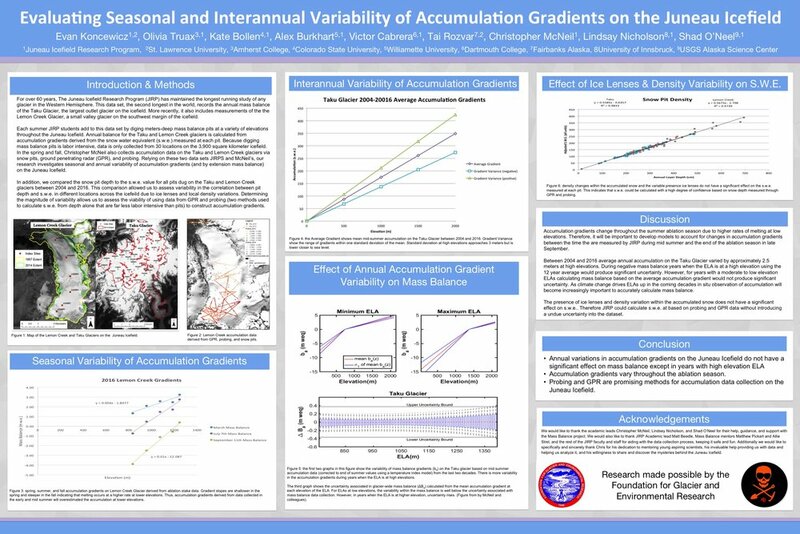 Pelto, M., J. Kavanaugh, and C. McNeil , Juneau Icefield Mass Balance Program 1946-2011, Earth Syst. Sci. Data, 5, 319-330, doi:10.5194/essd-5-319-2013. Truffer, Martin. Oral communication 2016. For this blog post, we'll provide some key points to think about rather than the questions as in previous posts. 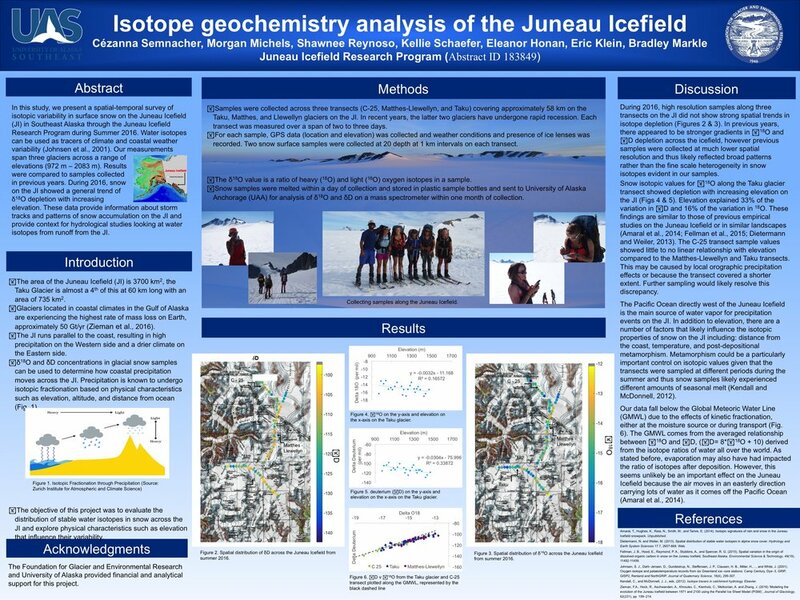 We look forward to some stimulating discussions in Juneau! Arendt, A.A., Echelmeyer, K.A., Harrison, W.D., Lingle, C.S., Valentine, V.B., 2002. 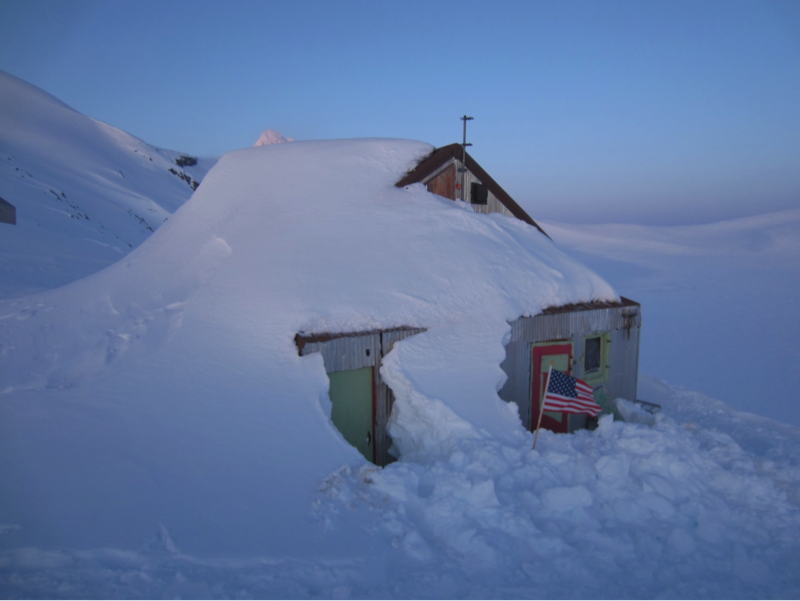 Rapid Wastage of Alaska Glaciers and Their Contribution to Rising Sea Level. Science 297, 382–386. Alaska represents only a small fraction of the world's glacier ice, but is among the largest sources to new water contributions to sea level rise. To understand why, think about two buckets filled with the same amount of water. Its a hot sunny day, and you and the buckets are hanging out in a parking lot. You trip over one bucket and spill it on the ground. That spilled water will evaporate much more quickly than the water in the bucket, in part because the surface area to volume ratio has changed. This is a good analogy to why Earth's mountain glaciers have more rapid rates of change than do the ice sheets. 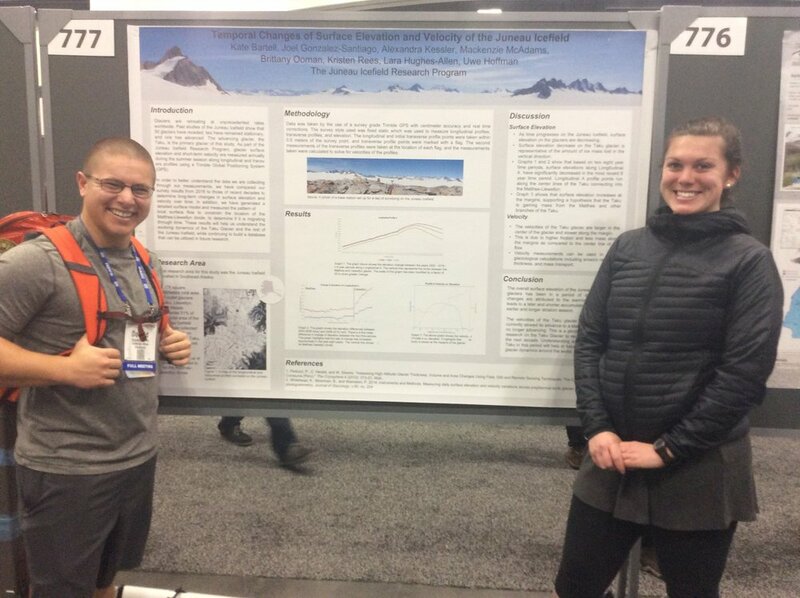 Climate and geography play a part as well, but this is a good place to start when thinking about differences between glaciers and ice sheet mass balance. Another aspect to consider as you read this paper are the research methods used and possible errors associated with them. All methods have errors, which can significantly impact research results. That's all for today. See you all soon! Today marked the first day we weren’t all doing safety training! While some JIRPers continued doing some safety training, others expanded our horizons to probing and surveying, and nine of us began digging mass balance pits. After the standard morning time activities (wake up call, breakfast, and work duties), we started getting ready. Considering the fact that most of us were already wet after our work duties, we all knew we were in for a cold, wet day. Those of us responsible for digging mass balance pits were divided up into two groups, each with a safety staff member to show us the ropes. 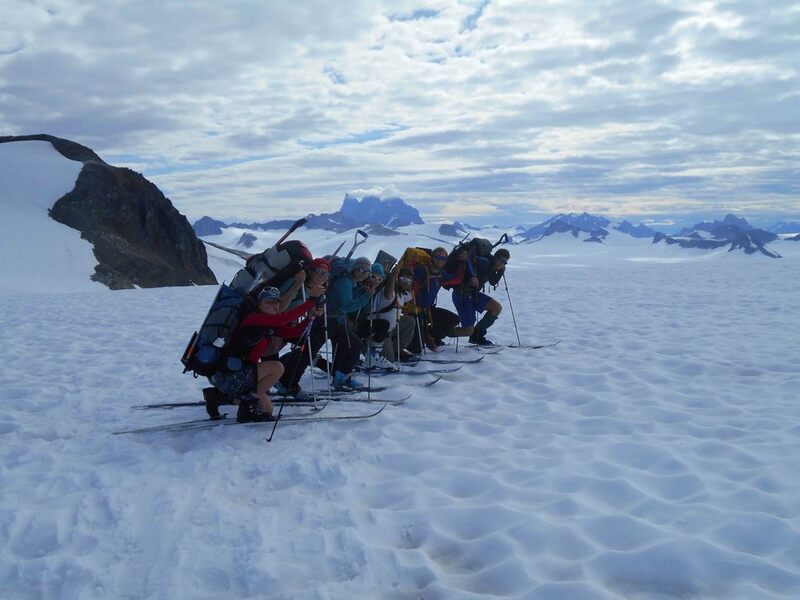 We skied north down the glacier for about half an hour before arriving at the dig location. The other group’s location was a bit closer to camp. Upon arrival, we got to work right away, after covering our packs with our tarps in a futile attempt to keep them from getting wetter. We dug, rotating positions from time to time, for about 4.5 hours. That warms you up quickly! My group was really quiet; I spent most of the time in a zone where the only thought in my head was where to shovel. It was very meditative work. The other group was chatting most of the time, which I’m sure created quite a different atmosphere. At one point, Dougal, one of the guys in the other group, started yelling out names of things he hates as he chopped at the snow. In these cold and wet conditions, I was very happy to just dig. However, in nice weather, I can see how digging with a little music and good conversation would be great as well. As for the actual digging of a pit, everyone starts in the pit until snow starts to accumulate around the edges. At that point, one moves to clear the rim of snow and the other four start focusing on one quadrant each. We would rotate from time to time at the beginning, but I think I spent about 3 hours in the same quadrant after that. Eventually, you have one quadrant that is very deep, and then the other three become progressively shallower. The one in the lowest quadrant eventually starts passing snow to people in higher ones so they don’t need to throw the snow up and out of the pit. This has been a low accumulation year, so we only had to dig to a depth of about 2.25 meters to find last year’s layer. It was really fun to finally see all the structures people had been telling us about, like the ice lenses and the layer of less dense depth hoar that formed above the much more dense snow from last year. We finished our pit before the other group, but they had all the scientific equipment so we skied up to their pit to grab that. Most of our boots were at the point where water sloshed from the toes to heels and back each time the angle of our feet changed. My overmitts had started retaining water long before, so each time I brought my poles up water splashed over my fingers. We ended up just separating into two new groups, one to head back to camp, and one to do the measurements because so many of us were very cold at that point. I am pretty sure we all enjoyed ourselves, at least in the type B version of fun. Below are a couple quotes from other students. Erik talked about how it’s the only way to really see the inside of a glacier, in a way we are evolutionarily developed to understand. He compared it to probing, which is completely uninformative for the senses we use. T’was the day of JIRPmas, and all through the camp every JIRPer was stirring, why even the mouse. The snow pits were all dug by the students with care, while hopes of helicopters danced through our heads. 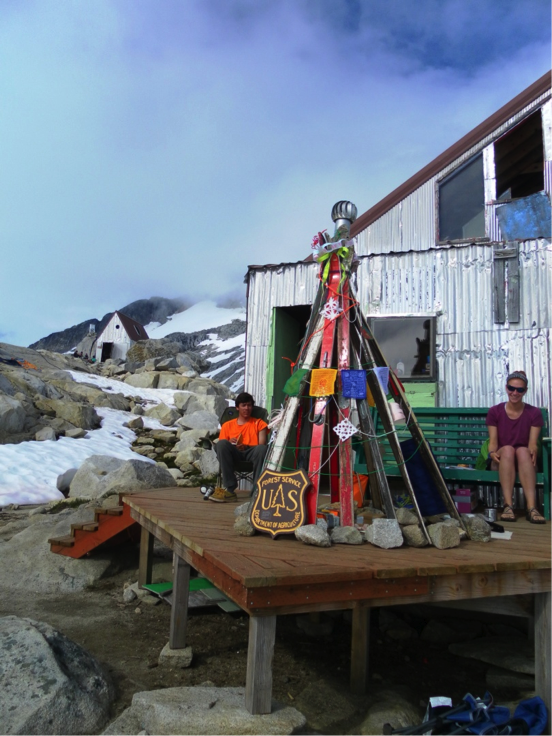 Alexei Doncov, and Leah Nelson enjoying the afternoon sun on the Camp 10 deck with our JIRPmas ski tree. Photo by Muriel Will. Greetings and salutations from Camp 10. Today (July 25th) is an honorary JIRP holiday, “JIRPmas”. We have all been busy on our breaks between lectures and field activities, making gifts to later exchange with our JIRP secret Santas. 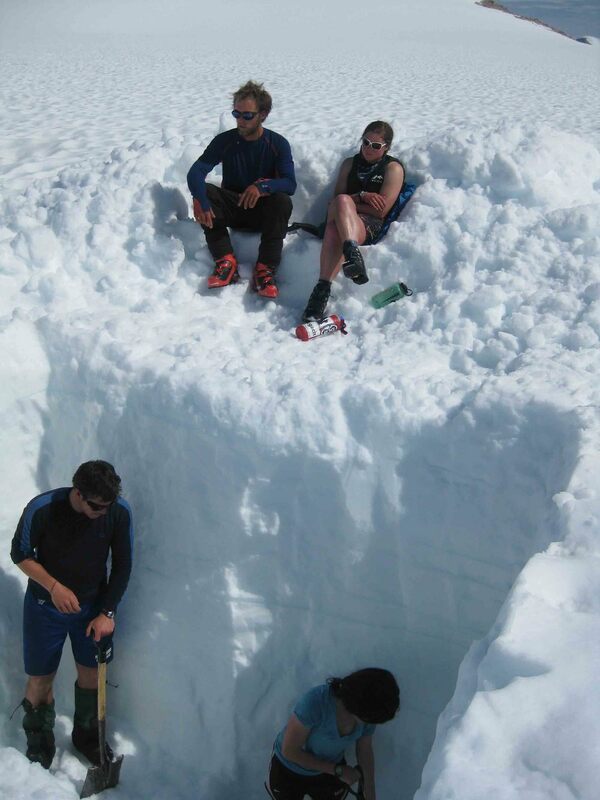 Although relaxing days such as this are a great respite after long days of digging and skiing, the true spirit of our team (and the extravagance of the landscape where we find ourselves) is most memorable when down on the glacier. Of the 3 mass balance camping trips going out from Camp 10, I was able to attend the second. For this trip, eleven students and four staff went up the Northwest Branch of the Taku Glacier with the intention of digging four mass balance pits. 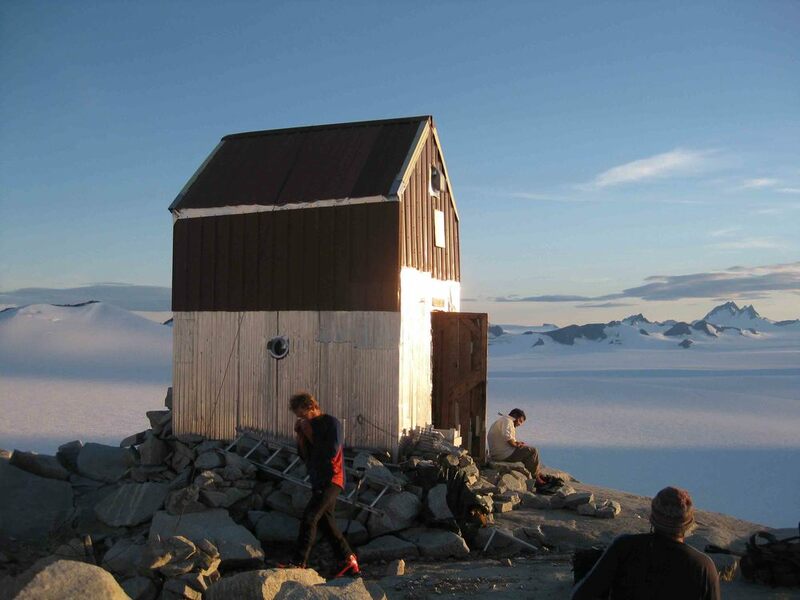 The first day (June 22nd) started off with some laughs and regretted goodbyes, as five of our visiting staff (including Alf and Stanley Pinchak, Jason Amundson, Bill Isherwood, and Jay Fleisher) departed our nunatak hideaway to return to their everyday lives. After a three hour ski to our camp site, we split our strengths between: digging our first pit, setting up tents, and making our kitchen. A 4 inch ice layer approximately a foot down in the snow pack, provided a perfect floor for our kitchen, though a bit of an obstacle for our digging crew . On the second day we split up into two groups, with each of us debating which view we wanted to see most. The day could not be more ideal, with beach-worthy weather, we spent the day in shorts digging and chatting as we dug our pit of nearly 5 meters deep. However, that was before we realized we had dug almost half a meter beyond last year’s ablation layer (the previous summer’s buried surface). After a long day’s work we began our 2 hour ski back toward our temporary home, and at 21:30 we found ourselves in a sunset landscape that can only be described as unbelievable. Skiing over snow turned pink by the setting sun, towards a rainbow stretching clear across the sky, the beauty could only be made more remarkable by the fire in the clouds at our backs. Tired and wet from the rain now misting as we skied, we were greeted after a nearly 12 hour day, by the hoots and howls of the second digging team. Our evening finished with a dinner of hot lentil stew, which the second team had prepared, but had refrained from eating until our much later return. The final pit of the trip was completed quickly, (July 24th) with all hands on deck, and although sad to leave our snowy getaway, a good dinner and dry feet were a welcome homecoming. July 23, a fiery sunset that can never be truly captured by a picture, nor described in words. Photo by Muriel Will. And so from Camp 10, merry JIRPmas to all. May we all find the strength in our limbs, a fire in our hearts, and may we never take for granted the people and places we encounter along the way.